At the beginning of 1944, the 3rd Parachute Battalion was quartered in Falkland and Freuchie, in the county of Fife. By the end of February the 3rd Battalion had completed its move to Cupar. Also based in Falkland was a Parachute Cadets School, which at one time was commanded by Captain Romuald Konarzewski. During the years 1941 to 1944 Mass was celebrated in the chapel by the Battalion chaplain Father Hubert Misiuda. Father Hubert had the idea of ​​offering the town a permanent remembrance of Poland. 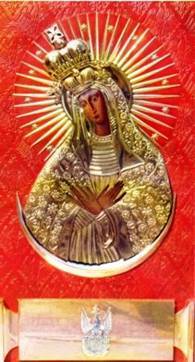 The icon of Our Lady of Ostrobrama was made by the talented 2/Lt Albin Bratanek. It was funded by the soldiers of the Battalion from voluntary Sunday contributions. In a modest ceremony, the picture was dedicated on 24th June 1944 by Father Misiuda. The icon measures about 150 cm x 70 cm. 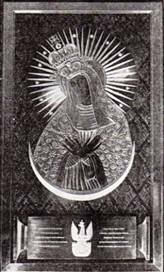 We the Polish Paratroops of the 3rd Battalion offer to you, the People of Falkland a picture of Our Lady of OSTROBRAMA in souvenir of our stay in Falkland and as a token of gratitude for all your kindness you have shown us when stationed amongst you. This picture must be kept for ever in the chapel of Falkland's Palace. May it cement the friendship of both our Nations. Captain Konarzewski, later Lt. Col. went on to command the 3rd Para Rifle Bn. He died in Kidderminster in 1991 aged 85. The website (The Catholic Church of Chapel Royal, Falkland) recalls the stay of the Polish paratroopers at the House of Falkland and how they filled the Chapel Royal every Sunday. The gift from the 3rd Parachute Battalion of the icon is displayed at the rear of the chapel.